It has been nearly 10 years now since Andrew Bogut had an idea. A decade before NBA Finals paths ran through Milwaukee, before 26 consecutive sellouts and energetic atmospheres surrounded the franchise that drafted him, Bogut would go to work 41 nights a year at the professional basketball equivalent of a morgue. In less harsh terms, the Aussie’s office was the Bradley Center, a 1980s arena built for hockey that for much of its late life was lifeless. It had no comforting theme song, only a hollow hush that far too often fell over empty seats. So, during the 2009 offseason, Bogut approached Bucks executives. His idea? Revolutionize the NBA’s soundtrack. His plan? Begin with 100 maniacs in Milwaukee. Every sport has a soundtrack, even if some are difficult to describe in blanket terms. Baseball’s is that soothing open-air hum, spliced with age-old nat sound. Football’s is a rabid roar. College basketball’s is exuberant, adolescent passion. Soccer’s is organic, creative song. But the NBA’s, at its post-Malice nadir, was either overbearing loudspeaker music or eerie quiet. Especially throughout a desolate 14-year run of bottom-11 attendance averages in Milwaukee. Which is why, at the beginning of the 2009-10 season, Bogut put up around $100,000 of his own money to fund a boisterous fan group that would fill the void. A decade later, despite flirtations with extinction, that group – now called the Clutch Crew – is thriving. It’s the source of the incessant noise that accompanied the Bucks to 60 wins and home-court advantage throughout this year’s playoffs. The one that could, if all goes to plan, come face to face with its founder in Game 1 of the Finals. It is part-college student section, part-soccer supporters club, part-team-funded cheerleading squad. To some, it is annoying, corny and out of place. It turns bemused heads and prompts casual fans to ask: Are the chants really going to go on all game? But to the Bucks, the Clutch Crew is an emblem of pride. To the dozen-plus NBA teams who’ve inquired about its logistics, or even attempted to copy it, it’s an object of jealousy. And the answers to their questions about how the Bucks built the NBA’s most robust supporters section? They didn’t just appear overnight. Nowadays, the Clutch Crew is a rotating cast of over 600 – 75 per game, standing at the top of Fiserv Forum’s Section 112. They are young and old, black and white, male and female, tireless and tiring. Only two, however, remain from Year 1, an indicator of just how rocky the group’s growth has been. It began with auditions in the Bradley Center atrium. Come prove your Bucks fandom, the franchise advertised, and free season tickets are yours. It seemed a simple sell – until a round of tryouts passed and, with the 2009 home opener approaching, around half of the 100 spots were still unclaimed. Dan Hoelzl, one of those two remaining originals, remembers a scramble to find members. The free tickets, he explains, came with a caveat, in the form of a waiver. It was effectively a fan contract: To retain the tickets, your performance – yelling, screaming, for two-plus hours 41 times per year, in support of a mediocre team – couldn’t slip. The tickets were non-transferable. And if you missed three or more games, you’d be replaced. The taut system filled the section in its inaugural season. But thereafter, attendance waned. Hoelzl remembers nights in 2012 when it was a quarter full. In other words: You’d have had to pay 75 of the 100 diehards to watch Bucks basketball. “If it had lasted one more year like that, I would’ve been surprised,” Hoelzl says. That offseason, with Bogut traded to Golden State in March, some were unsure whether “Squad 6” – the group’s original Bogut-inspired name – would continue to exist. But Ersan Ilyasova stepped up to help underwrite it. Jason Kidd, during his tenure as head coach, eventually would as well. 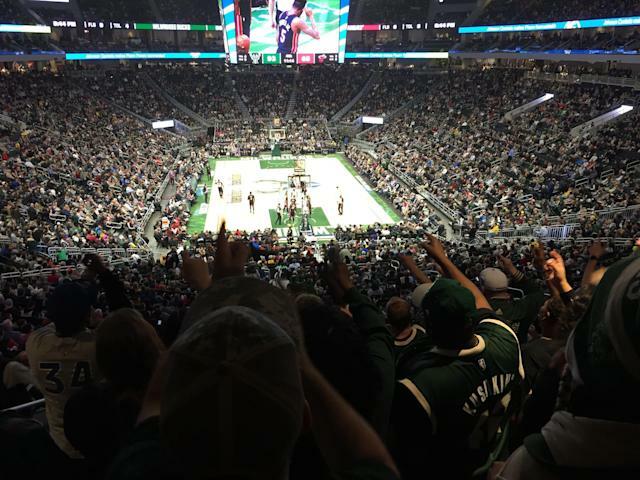 Structural changes turned control of tickets over to the renamed “Sector 7.” Johnny Watson, the Bucks’ incoming director of live programming and entertainment, blended it into the game-night experience. The franchise also hired a part-time liaison, Ben Fink, to run the section. In 2017-18, Harley Davidson swooped in to sponsor it. With Fink recruiting new members, managing tickets and coordinating chants, the rebranded Clutch Crew developed from what Bucks CMO Dustin Godsey calls a “loose, rag-tag group” into what it is today: a diverse, dedicated band of superfans who are, in a way, no longer necessary; but who are nonetheless appreciated for what they do. Turn on NBATV Wednesday night, and you’ll undoubtedly hear them. A little after 8 ET, when the Bucks tip off Game 2 of their first-round series against the Detroit Pistons, you’ll hear the classics. The “Defense” chants, to different rhythms, sometimes with claps interspersed, sometimes DJ-prompted. You’ll hear “Here we go Buuuuucks, here we go”; and “Let’s go Bucks,” just like you would in other pro arenas. You’ll hear premature shot-clock countdowns and wordless noise like you would in college. It’s all audible, albeit often faint, through TV microphones or from the opposite side of the arena. There are sharp, punchy chants, such as “Lock them down,” or “Let it fly.” There’s a wide range of city-, team- or player-specific choruses. And, of course, the “MVP” chants for Giannis Antetokounmpo – which used to be louder until word filtered through to the fan squad, via game ops staffers last year, that the impossibly humble Greek Freak wasn’t fond of said chants. If you venture to Milwaukee, you’ll also see the Clutch Crew, back of the lower bowl, behind the west basket. You’ll see their outfits – the throwback Kareem jersey and the personalized “KUSHKING” J, the green-beaded necklace and Bucks purse. 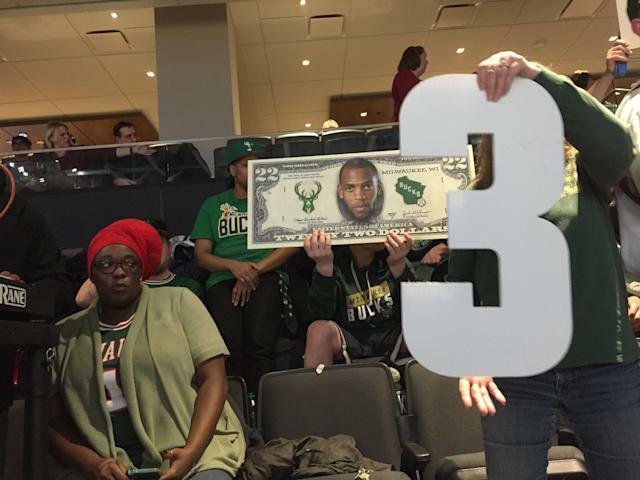 You’ll see their props – the big heads and clever signs and scarves, the blown-up 22-dollar bill with Khris Middleton’s face on it, the Greek flag. You’ll see them all because the Bucks resisted economically-sensible temptations to bury them in the rafters. The fan squad was born at a time of depressed demand. A time when at least 100 lower-bowl tickets would often go unsold. That time is long gone. “The Bucks,” Hoelzl admits, “absolutely could have sold every one of the [Clutch Crew’s] seats, almost every game.” Had they done so at face value, around $326,000 – plus roughly $19,000 per playoff game, minus the money Harley Davidson is paying to sponsor the section – would have trickled down to their bottom line. The dilemma, though, helps explain why the trend hasn’t spread league-wide. Franchises in massive markets, for the most part, have no trouble selling tickets. Other adopters all dwell in mid-size markets. The Houston Rockets were actually pioneers. Then came Milwaukee, then Indiana, Atlanta and others. The Brooklyn Nets, who finished the 2018-19 season last in attendance, recently followed. Others, though, have tried and failed. Detroit held tryouts … and 11 fans showed up. Houston’s Red Rowdies, meanwhile, are the elder statesmen, but remain 50-strong – essentially a smaller version of what the Bucks had back in 2009. The Bucks have professionalized and integrated their fan squad to an unrivaled degree. With it in critical condition back in 2012, they studied MLS franchises, specifically the Seattle Sounders and Portland Timbers, to learn about formalizing and working with supporters groups. They now pay Fink, who’s half enthusiastic leader-by-example, half soccer-style “capo” – his back occasionally turned to the court as a musical conductor’s would be to an audience. Watson communicates with him via an earpiece, so he can keep the Clutch Crew in sync. It’s a fun job, but a demanding one that also involves roughly three hours of administrative work in between games. Then, on game days, Fink will arrive three-to-four hours early for operations rundowns. During the action, he’ll call out cues, shuffling back and forth in the section’s front row to maintain synchrony. During timeouts, he’ll dab at his sweaty forehead with a paper towel, then reach for one of five water bottles stashed in his backpack. By night’s end, he’s physically exhausted. So are his troops, some of whom attend one game and quickly realize this isn’t for them. The Clutch Crew, instead, has carved out its own niche. It injected life into lifeless Bradley Center. It has facilitated friendships and even first dates. Now, with the Bucks reincarnated in a new arena and a championship within reach, it is giving home-court advantage a unique ring.